How to name or buy a star? Naming a star is widely considered one of the most original and heartfelt gifts. The symbol of a star carries great value amongst human beings. It reminds us of the possible eternity of our lives and the vastness of the universe. In this article we answer all questions related to naming and buying a star. This is the ultimate guide to everything you need to know about naming or buying a star! How to pick a star? The Online Star Register maintains a database of stars within relatively close distance of our planet. Each star has a specific set of coordinates and characters, for example: RA 13h03m33.35 -49°31’38.1” dec 4.83 mag Cen. RA is the abbreviation for Right Ascension and dec is the abbreviation for declination. They are similar to latitude and longitude, but they relate to coordinates in the sky. Mag stands for magnitude, which is the brightness of the star. The limiting brightness of stars seen with the naked eye is about magnitude 6.5. With binoculars, you can see to magnitudes of about 10. For magnitudes beyond that, using an amateur telescope is recommended. Cen, in this case, stands for Centaurus, one of the 88 constellations that can be found in the sky. Knowing the constellation can help you locate a star more easily. So which constellation should you choose for the star you are naming? You might want to opt for a star in one of the 12 zodiacs, a constellation from your own hemisphere, or opt for a randomly assigned constellation. If you’d like to find out more about the 88 constellations, please feel free to download the interactive OSR Star Finder app. How to name a star? Naming a star using our order form is easy. All you need to do is choose a name for your star and a star date. 1. The star name will quite often be similar to the person the star is named after, like ‘John Thomas’. Of course you can also name the star after you and your partner, so for example ‘Sam & Linda’. Each star registration will be connected to a unique star code, which means the star name doesn’t have to be unique (there can be multiple stars named ‘Sarah’ for example). Please note there’s a character limit of about 20 chars (depending on your language). If you’ve made a typo or changed your mind about the name, you can still change it before the gift pack is sent. With the Online Star Gift, there’s no deadline for changing the star name. 2. The star date you connect to your star, can be any date in the past or future. The default choice is the present day. Popular choices are dates which relate to an occasion or event, such as the day you first met, a birthday, a wedding day, a birth, or a passing. The star name and star date, along with the constellation of your choosing, are the main elements of your star registration in the Online Star Register. How to personalize the star gift? Here, or in the video below, you can learn more about personalizing your star gift with the OSR Star Page. How to buy a star? The reason the gifts from OSR are often referred to as ‘buy a star gifts’, is because you are purchasing an actual gift (the gift pack). However, in technical terms we are not talking about buying a star, but rather about naming a star within the Online Star Register, which is the service OSR offers. View a star in One Million Stars! Because you will receive all of the items listed above, naming a star in the Online Star Register isn’t free. If you’d like to pick the coordinate of a star you like and craft a certificate for someone yourself, this is perfectly fine. However, if you really want to surprise someone with a gift with many unique aspects, you might want to consider choosing one of the gifts from OSR. NASA stands for the National Aeronautics and Space Administration. The organization oversees America’s spaceflight capabilities and conducts research in space. NASA has nothing to do with star names and naming stars at all. The only organization which publishes stars named by the scientific community, is the IAU (International Astronomical Union). This means that if you want to name a star as a gift for someone, NASA isn’t the place to go to. The right place, is the Online Star Register. Finally, you can also name a star after someone who has left the Earthly plane, but will forever be amongst the stars. How to find a star? When you’ve registered a star in the Online Star Register, there are many options of locating it in the night sky. No matter which method you choose, you must use your OSR Code, which is highlighted on the OSR Code Explanation Sheet in the gift pack. Using this code, you can look up your named star in our breathtaking One Million Stars browser app. Fly to your star and experience it in 3D! 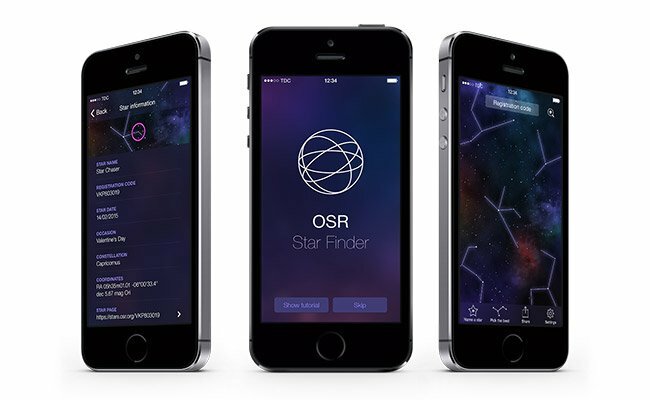 You can also download the free OSR Star Finder mobile app, which you can use to locate your star in the night sky any time of the day. On your personalized Star Page, the star is visualized with Google Sky. Finally, you can also locate your star using the OSR Star Map in the OSR Gift Pack. If you’d like to learn more about how to find a star which is registered in the Online Star Register, please have a look at our specific article about locating your star. What do people say about their star registration with OSR? What else is there to know about naming, buying, or adopting a star? People all around the world are naming stars for their loved ones. From the USA, the UK and Canada to Europe, Africa, Asia and Australia. 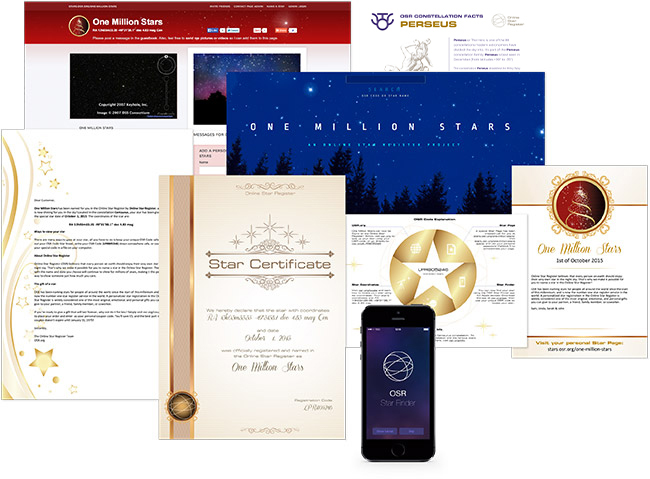 The gifts from Online Star Register are available in 20 languages, and so are the Star Pages, the OSR Star Finder and One Million Stars. Naming stars is international, universal and can easily be done online. 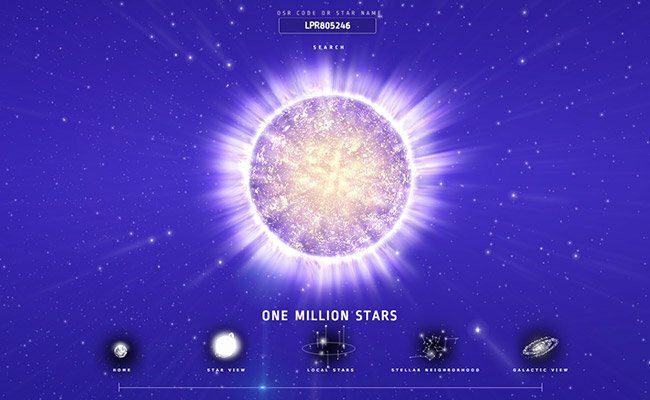 Once you’ve registered your star, it will immediately be visible in One Million Stars, the unique browser app which visualizes stars in our galactic neighborhood. This makes your star gift extra special! So why name a star after someone? 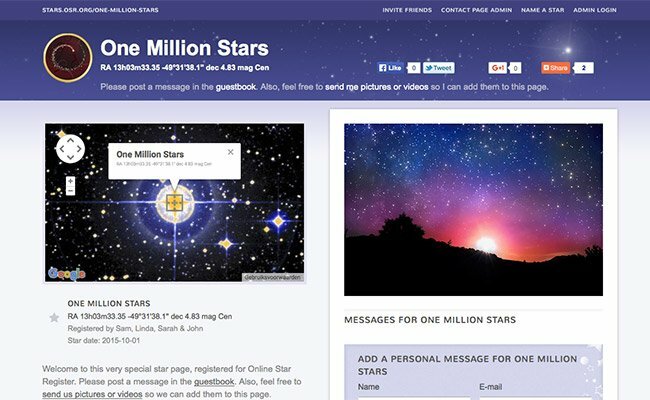 Online Star Register believes that every person on earth should enjoy their very own star in the night sky. Why should you name a star? We’ve answered that question for you in the video below. Ready? Name a Star Now! Name a star now! - How to name or buy a star?